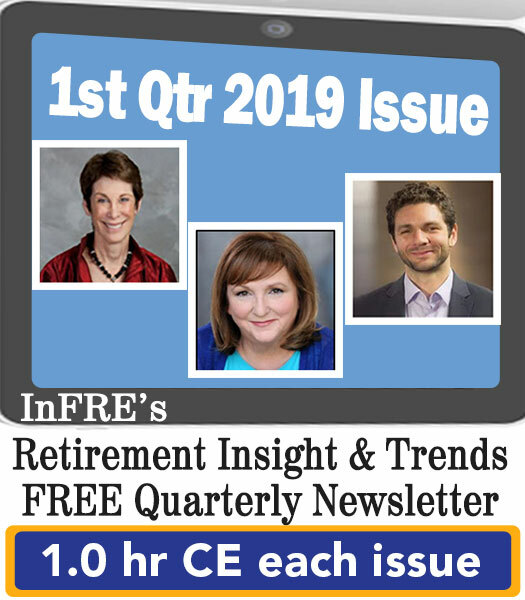 Editor’s note: This article is an adaptation of the live webinar delivered by Robert Laura in 2018. His comments have been edited for clarity and length. 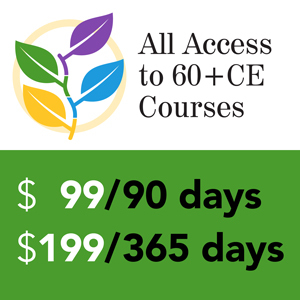 You may also choose to take the full length course How to Make Your Clients’ Money Last Longer with Withdrawal Sequence Strategies for 1.0 hour continuing education (CE) credit. There is a framework we can use for how to optimize withdrawal strategies, or at least how to approach it with your clients to make sure that you’re coming up with strategies that are the best for their families. A withdrawal strategy is how to tap your holdings in a smart way to make your money last longer. Mostly, everyone in America and most software today use a very similar methodology – aka the conventional wisdom – to show a retiree how long their money is going to last. However, we know that we can beat the conventional wisdom every time. 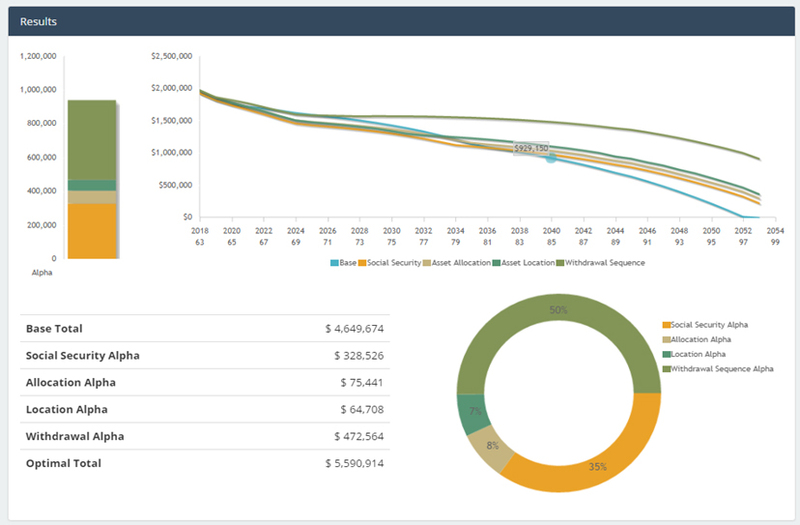 We’ve found that for both Social Security and retirement income if you show what something looks like in the future, it changes behavior, so I’d like to show you what we’re having success with and what advisors we partner with are doing well. At the highest level, as someone in their 50s is approaching retirement, there are two key areas that we found in the marketplace that are gigantic differentiators. The first is Social Security optimization. Unfortunately, there’s a misconception that Social Security is more straightforward after the recent rule changes; that not the case as there are so many nuances and details. It is easy to find more money for your clients if you can leverage all the rules to their advantage, and in some cases, it’s hundreds of thousands of dollars of additional money for that client. Note that Social Security does have unique properties, and we’ve written a lot about what we call hedging longevity risk which is the risk of living longer than you expect. So, not only can you find more benefits by leveraging all the rules, you can create strategies that pay more as you live longer than you expect, and this is important since we all know most of our clients underestimate how long they live. In 2012, I wrote a study on how Social Security optimization adds to portfolio longevity, and how we can make someone’s money last two to 10 years longer. In 2015 we published “Tax-Efficient Withdrawal Strategies” in the Financial Analyst Journal (the CFA Journal). In that study, we showed that on average we could make someone’s money last seven years longer. In a world where one of the top concerns for a retiree is running out of money, these are nice value propositions that you can bring to help your clients and grow your practice. Why Does the Financial Industry Need to Move Beyond Accumulation? Literally, in every 401(k) plan the focus is on growing money and growing savings, and retirement income is typically brought forth with an annuity product or a target date fund. As we all know, Social Security is going to contribute significantly to someone’s retirement. Also, we have healthcare costs, Medicare; so we need to be smart on how we coordinate and focus on generating retirement income beyond just a single product. Every time your clients draw down to generate income or pay for an electric bill in retirement, it’s generating a taxable event. You’re withdrawing from an account. There’s a tax component to this. We cannot brush that under the table. Simple high-level guidelines for Social Security claiming or the Four Percent Rule that doesn’t take into account taxes or Social Security – we need to get into those details and do it in a way that’s usable and simple for retirees to understand. The final thing I’ll say here is that Social Security is indeed the cornerstone to retirement income. Why? Whether you’ve saved a lot or a little, it is a material amount, and typically, the income stream is pretty lumpy. How it goes up and down will delineate how you tap or how much you need to take out of your savings. If you take money from your savings in the wrong sequence, you can actually impact the taxation, which is as high as 85% or as low as zero, so we want to be smart around how we put those pieces together. The good news is that it is clear academically and mathematically that there is a better way to draw down. The question is if you can figure it out; it’s super complicated. However, it is clear that there is a sequence that can make someone’s money last longer. The problem is that it’s different for every household, and some of those general rules of thumb for someone who’s rich are totally different for someone from middle America. The good news for you is that if you figure out how to integrate Social Security planning into your practice, you’ll deepen relationships and there’s no doubt that the quality of your advice will go up. You’ll be looking at all the assets in that household. Retirement income is different from most relationships because your clients need to come back and visit with you. They’re going to be withdrawing monthly until they pass away, so again, it’s a nice niche. How Does a Withdrawal Strategy Compare to the Conventional Wisdom? What is the best way to tap your savings, coordinate this with Social Security and Medicare, and compare it to what everyone is doing today? The conventional wisdom is used by Fidelity, Vanguard, T. Rowe Price – almost every large institution uses this in their retirement planning tools and projections, and that conventional wisdom is – with any savings amounts entered into their technology – to tap into any taxable accounts first until they are exhausted. Then tap the tax-deferred accounts, such as IRAs and 401(k)s, until they’re exhausted, and then finally, tap Roths. This withdrawal sequence will generate income until money is gone and is the default approach in eMoney, Money Guide Pro, and NaviPlan. As I look at it, this is the go-to that every advisor uses in their financial planning software and every institution is using in theirs. From here on, I’m going to compare a better withdrawal strategy to the conventional wisdom because everyone is using the conventional wisdom as their default. Know that this default is probably what I would call more of a rule of thumb – a place to start. We can beat the conventional wisdom every time. Many advisors ask me about doing Roth conversions. If you’re doing a Roth conversion to the top of a tax bracket, you may have perfectly implemented that Roth conversion in an elegant way for one year, but you may have inadvertently caused your Medicare premiums to go up thousands of percent. It would be best if you made sure that the left hand and right hand are coordinated. Imagine that the graph below is for a client with $2 million, and each line represents a different scenario. We’re going to focus on the attribution of what Social Security adds, asset allocation and rebalancing, asset location, and the withdrawal sequence. The spending is going to be exactly the same for every scenario. The blue line is the conventional wisdom: Drawdown first from taxable assets, then tax-deferred, and then Roth. The conventional wisdom strategy runs out at age 97. If we add Social Security optimization, we move the blue line to the orange line, so the client can get $328,000 more in Social Security. These seem like big numbers. We do this every single day, and you can add a ton of value just by adding in a Social Security strategy with a withdrawal strategy. Besides, if we’re doing quarterly rebalancing and some tax-loss harvesting, we can add another $75,000 by changing the asset allocation, so we move from the orange line to the beige line. Asset location adds another $65,000 (the green line). The withdrawal sequence – that order in which we’re going to tap things – is the top green line. By showing your clients this, that by working with you, with the same market expectations and tax environments, just by implementing proper Social Security rebalancing and the withdrawal sequence, you can add five to thirteen years to their retirement. What is the Tax Torpedo? I’m going to use married couples filing jointly as an example, and I want to juxtapose where we are now to where we’ve come. As everyone knows, right now, we’re scheduled to go back in 2026 to where we were before this change. Look at the row for the 24% tax bracket. Right now, taxable income can be as high as $315,000 to be at the top of the 24%. If you go over to the 2026 or later column, the top of the 25% is $156,000. So for essentially the same tax drag – even one percent less –, you can withdraw as much as over $300,000 now. So, I’m just looking for any household that is around that 24% range –why wouldn’t we try to take out a little bit more, all the way up to that $300,000, if you think you could be in a higher tax bracket in the future? If you look at the late ‘70s and early ‘80s, taxes were through the roof, and given ratios and studying the history of taxes; it is likely that we will see future taxes go way up. I’m not the first person to say tax rates now are probably at an all-time low. Looking for opportunities, which I call smoothing, is where you can take out more money at a lower tax bracket today, knowing that you’re likely to be in a higher tax bracket in the future. For many people that retire, there is a period – especially before required minimum distributions set in at 70½ – where you’re in a lower tax bracket. This provides an opportunity to think about Roth conversions and how you tap your savings can add much money later. It is a tremendous opportunity, as is the opportunity in which you claim Social Security. The concept I want to introduce to you next is to not just think about your federal tax bracket. I want you to think about your marginal tax rate. That’s the tax rate of the additional dollar that you take out of an account. I’m going to use Social Security and Medicare as our examples now. A paper that I wrote in the Journal of Financial Planning was a concept that we introduced around the tax torpedo is an update to a paper written in 2013. What happens with Social Security is that it uses a calculation called provisional income. Provisional income is a variant of MAGI – modified adjusted gross income – and we put a little “PI” next to it because it’s different from the modified adjusted gross income for Medicare. Now, at this point, you’re like, “Oh, my gosh, Bill’s gone crazy.” These tax calculations matter, so you’ve got to get into the details. Provisional income is half of your Social Security and tax-exempt interest and your modified adjusted gross income, which is everything in your AGI except for the taxable portion of Social Security. 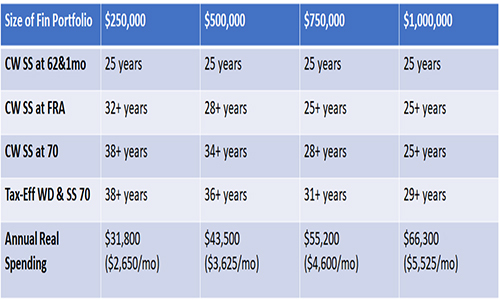 The thresholds for a single person, which is the example here, are $25,000 and $34,000. So, what we’ve done is shown what the tax bracket is for every level of MAGI PI corresponding with the amount that Social Security will be taxed. You can see that at the first levels (10%), I add in 50% of my Social Security being taxed. That additional dollar causes $0.50 more of Social Security taxation, so you’re not in the 10% tax bracket, you’re in the 15% marginal tax rate. This is the real rate that you’re going to experience. I look at it as you need to look at all the elements that impact your retirement plan. Now you can see if that I’m in the 12% tax bracket on my return, 50% of Social Security is taxed, so again, that one additional withdrawal from a tax-deferred account is going to be taxed another 50% of Social Security, so that 12% tax bracket is really an 18% marginal tax rate. You can do the math as $1.00 times 12% times 1.5. That gets you to 18%. You can see that this keeps going up and peaks at the 22% tax bracket. Now you’ve moved from 50% of your Social Security being taxed to 85%, so that additional dollar gets another $0.85 of your Social Security taxed. You’re now not in the 22% tax bracket; you’re in the 40.7% marginal rate. So be careful how you’re managing your withdrawal sequence because what we show in our software is that it’s easy to change your sequence or a claim for Social Security with a withdrawal sequence where 40% is being taken out instead of what you think is 22%. I see tons of advisors just focus on the tax bracket, which is the mistake. Now, note that in 2026, we’re going to flip back to the old tax regime, so the top of the torpedo under the old rates is 46.25%. Experiencing a marginal rate of 40.7% or 46.25% is punitive if you don’t coordinate when you take Social Security with your withdrawal sequence. What we’re trying to do is make sure we withdraw in a way that we’re not going to get torpedoed. Now, another question that always comes up is advisors say to me, “Hey, all my clients are rich. They’re all going to be taxed at 85%.” I would say flat out that I do not believe that to be true. Now, there are a lot of wealthy people that will already be at the top range, and this won’t apply to them. We see many cases where you have a lot of money, but we can change the withdrawal sequence to put them in a lower-tax situation, especially right after they retire. We see this in families that have up to $3 million. So, again, make sure you’re doing this assessment so you’re not torpedoing your client’s Social Security. Medicare premiums are based on a tax calculation, and we talk that MAGI MED – modified adjusted gross income for Medicare is AGI plus tax-exempt interest. It’s a little twist compared to what we just said. Essentially what happens is that for every threshold level, your premium goes up. These thresholds – based on your Modified Adjusted Gross Income – really start to get pretty high. Let’s look at couples. If you go $1 over $170,000 of MAGI MED, you can see that your premiums go up precipitously per person by almost $1,600 a year. 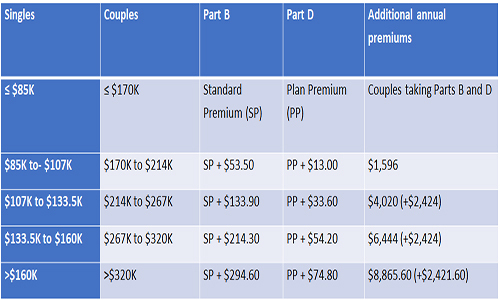 If you go $1 over $214,000, your premiums now go up to $4,000 per person per year. There are huge increases. So why am I talking about this? I’m back to a tax bracket. 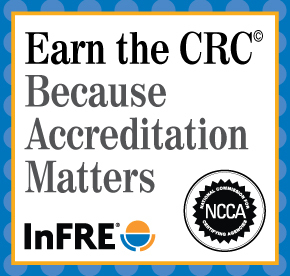 Advisors and other software people are starting to look at Roth conversions or withdrawing to a different bracket. What I’d say is you can go to the top of a bracket, but then really have a problem that you’ve gone over one of these thresholds. I’ll tell you – you would probably get fired by your client if you do this perfect Roth conversion to the top of a bracket but increased their premiums by 6,000%. They’re going to find that out, so make sure that you check Social Security as you’re doing your withdrawal sequence. This topic combines some of my research. It still just blows me away – the additional value we can provide just looking at Social Security and that withdrawal sequence. Let’s look at those two dimensions and one example. Agnostic of the size of the portfolio – how much your client has saved – we can add a lot of value. The value is going to be different, but we can add value. First, let’s focus on the additional longevity Social Security brings for a single person. I’m going to use the example of someone single whose primary insurance amount – that’s the amount they get at full retirement age – is $2,200. Assume that person has $250,000 of savings and they start Social Security early, and their spending is $31,800. Essentially their portfolio is going to run out after 25 years. Let’s keep going down the rows. If this person delays until full retirement age, you can see that their money is going to last seven more years. The question is why is that? By delaying, they would be winnowing down their savings, paying out of savings until Social Security kicks in, but the additional amount that you would get out of Social Security means that we’re withdrawing less later on. That’s why we’re getting more. You can see on the next row down that if this person delays until 70, you can make the portfolio go from 25 years to 38 years. Again, this is the takeaway in our research in the Journal of Financial Planning that said that for people who have not saved enough, actually claiming Social Security to get the most out of the system adds the most value. Now let’s jump over to $750,000 column. Starting early – the portfolio lasts 25 years. Delaying to full retirement age is late 25, but added value, and then 28 years. So, we added a three-year delay to Social Security and get 13 more years out of the portfolio. You can see that for a $1 million portfolio, we are adding a little bit every year, but on a percentage basis, it’s not as much. Now, let’s bring in the withdrawal sequence. Back to the person with $250,000. For someone that doesn’t have as much in savings, we couldn’t add as much value from that withdrawal sequence, but you can see that it goes up as you become more affluent. For someone that had $500,000, we took the conventional wisdom with Social Security that we could add over two more years of longevity, and at $750,000, we went from 28 years to 31. Again, if you went to your clients and said, “Hey, I can make your money last three years longer by drawing down,” your clients are going to be pretty happy. In that affluent case, it would be another four years. These two things together really make a big difference. The decumulation methodology is different from accumulation. Don’t think the two are similar. The two ingredients of just looking at Social Security with the withdrawal sequence add a ton of longevity over the conventional approach. Be careful – tax brackets are not the marginal tax rate. You can torpedo Social Security and Medicare. Make sure to look at the marginal rate, not just the bracket. Make sure you choose the right income threshold. Know that you may need to have two or more sequences based on the clients with whom you work. Also, finally, here’s the bad news: There’s no one-size-fits-all. You need to do the work to figure out what’s best for your clients. Typically, that means showing them different strategies side by side. If anyone is interested in a more technical view than what was covered here, please look us up in the public domain or feel free to reach out to me. Our Social Security Strategies book has sold over 50,000 copies, and lots of people enjoyed that if you want more technicalities on those strategies. 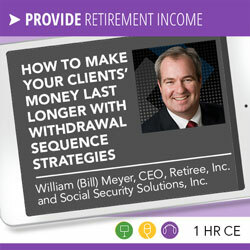 About William Meyer, CEO, Retiree, Inc. and Social Security Solutions, Inc.
William (Bill) Meyer, CEO, Retiree, Inc. and Social Security Solutions, Inc., is a nationally recognized expert in retirement income withdrawal strategies and Social Security claiming strategies. With Dr. William Reichenstein from Baylor University, he developed Income Strategy and Social Security Solutions, the leading retirement income management and withdrawal software for financial advisors, IncomeSolver.com. Bill’s robust research is recognized for identifying the sub-optimal nature of the conventional wisdom currently used to create withdrawal strategies and solving the gap in retirement income with a tax-efficient withdrawal strategy that is proven to extend portfolio longevity by up to a decade. Bill has been the featured speaker at national events, and recently spoke in front of a Senate Committee regarding improving Social Security. He is a former Trustee of the Securities Industry Institute at Wharton and holds multiple securities licenses. ©2019, Robert Laura. All rights reserved. Used with permission.